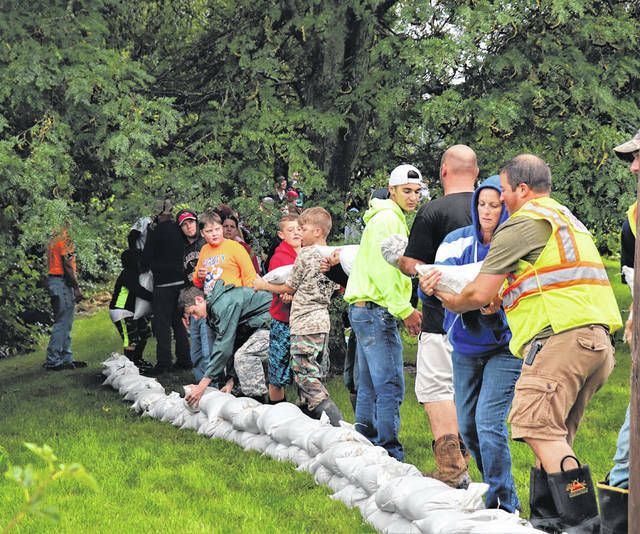 Volunteers pile sandbags near the creek in New Madison. The village received nearly 5 inches of rain Saturday, with more rainfall expected Sunday and Monday. Sandbags are filled at Tri-Village High School. Both the school’s sports field and nearby residences experienced flooding Saturday. Some residences at Arnold and Main Streets in New Madison experienced flooding Saturday due to excessive rainfall. Multiple Fire and Rescue agencies responded to help pump out water from flooded basements. NEW MADISON — With the remnants of Tropical Storm Gordon moving through the area, the Village of New Madison, and volunteers from surrounding communities, jumped into action to help in efforts to both recover from, and prepare for further flooding, in the village. New Madison received nearly 5 inches of rain overnight into the early morning hours of Friday and Saturday that led to substantial flooding in the southern portion of the village. New Madison Fire Department began fighting the floods as calls began to come in of residents experiencing high water, in the area of Arnold and Main Streets, both standing in yards and roadways as well as up to 10 plus inches in their basements and crawl spaces. According to New Madison Fire Chief Robert “Scoob” Cook, the entire Tri-Village School’s sports complex, including the football field and fieldhouse, were completely under water as operations began. Efforts quickly started to build with the start of a work detail at approximately 10 a.m. when firefighters and volunteers alike gathered to start building sandbags in an attempt to fight back the flood waters. A One Call was eventually placed to the village residents to request volunteers to aid in the efforts. It is believed that more than 200 volunteers answered the call and assisted in one way or another throughout the course of the day. After a brief break in action for a meal, supplied by surrounding businesses and residents at the Tri-Village High School cafeteria, work quickly resumed around 1:30 p.m. with the placement of sandbags around the southern part of a creek running through the area. Because of the size of the operation, multiple agencies were on hand to assist in the flood efforts. Departments from across the county lent manpower and equipment to ease the burden on the locals. Darke County EMA, Arcanum Fire, Pitsburg Fire, Gettysburg Fire, Liberty Township Fire, Versailles Fire, Greenville Township Fire, Tri-Village Rescue, and many others provided assistance. Many businesses from across the county also contributed to the cause with donations of equipment, manpower, food, bottled water, coffee, and more. 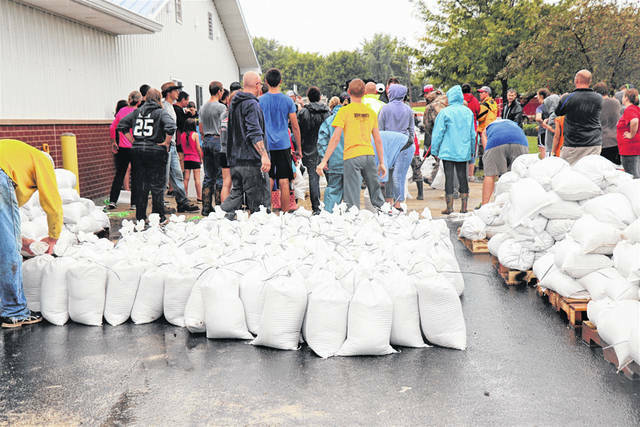 Sandbagging continued into the early evening hours as crews and volunteers fought against time to beat the incoming heavier rains in the forecast. In the end, Chief Cook gathered with everyone and thanked them for their hard work. 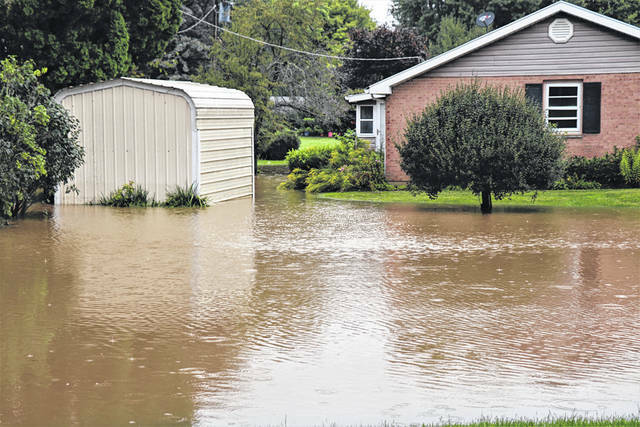 The National Weather Service out of Wilmington was calling for more rain Sunday and Monday which may further complicate the situation in New Madison and other areas in Darke County. The Darke County Highway Department announced Harrison Road between Rush Road and Downing Road and Palestine-Union City Road between Wasson Road and State Route 571 were closed due to high water.